These full size solid red wood horse urn's come with (2) 4" x 6" photo holders which can be attached in any position depending on personal preference. 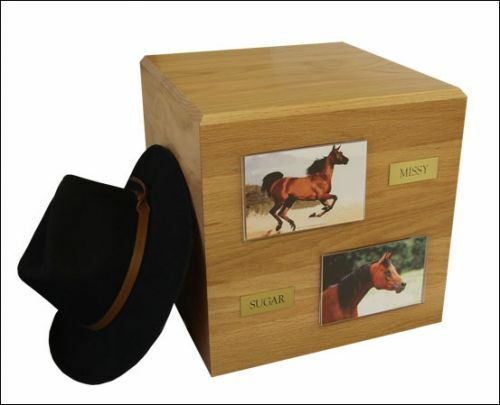 Description These full size solid red wood horse urn's come with (2) 4" x 6" photo holders which can be attached in any position depending on personal preference. Also included are (2) custom engraved brass nane plates for personalization at no additional charge. Measuring 13.5" x 13.5" x 13.5" this urn will accomidate the cremated remains of a 2000 lb horse or can be used as a compaion urn (for 2 horses). Hat not included.